1. Burt’s Bees Baby Bee Nourishing Oil: Perfect for glowing, moisturized ski . 2. Burt’s Bees Honey and Shea Sugar Scrub: Ideal for scrubbing away dead skin for smooth, soft skin. .
3. Burt’s Bees Aloe and Linden Flower After Sun Soother: This intensely hydrating, quick-absorbing face and body lotion is packed with natural aloe vera and linden extract to soothe sun exposed skin. And as a Summer side note, right now my favorite Burt's Bees product that I'm absolutely loving is their Eye Brightening Treatment. 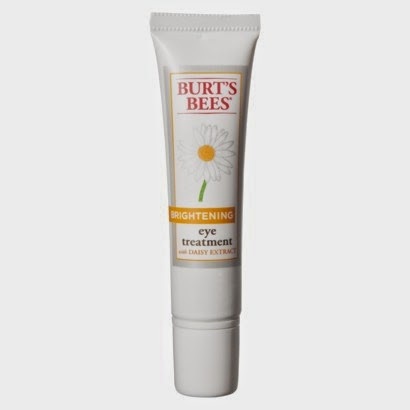 For $19.99 Burt's Bees offers you a fabulous eye brightener that helps for a more youthful appearance. This is a product that helps get rid of dark under eye problems along with fine lines and wrinkles. In a test, 94 percent of women saw a brightening under their eye area. I've been using this for approximatly 2 weeks and I've seen a big difference in my eyes, I don't look as tired as I usually do, and my skin around the eye is more moisturized. 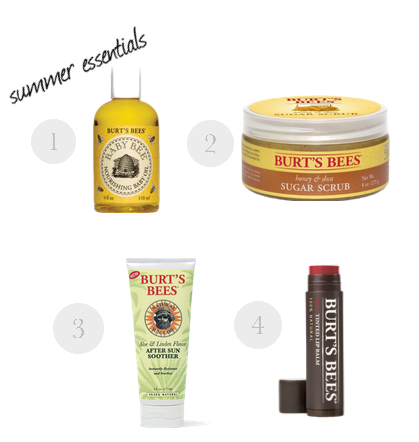 Stay tuned to my blog for more Summer Essentials from Burt's Bees, which is a post I will be writing every couple weeks. Burt's Bees is a company that most people can not only afford, but easily access because most drugstores do carry it in their skincare aisle. My local Walgreens has a huge area dedicated to the company. So if you're new or unfamiliar with the brand, I highly suggest this Eye Treatment; for anyone looking for a bit of extra brightness this Summer!